Bret Morrison was one of the actors to portray The Shadow on the radio. 02/19/1974 0042 Sea Fever A fearsome captain of the seas inflicts the ultimate punishment for people who even dare to look at his wife. But some people can't contain their passions for her. 10/07/1974 0157 Sister of Death A young woman who recently wed buys a portrait at a public sale. It is the portrait of her husband's former wife, who was murdered during a burglary. 09/10/1975 0341 The Ideas Of March A wife desperately attempts to get her husband to cancel his business trip when she foresees his death in a vision. 09/11/1975 0342 The Voice of Death His fate takes a turn for the better when a down on his luck ventriloquist comes across an unusual doll. However, a sinister plot is set into motion when he takes the dummy as it's creator plans to take his soul in exchange. 09/25/1975 0351 The Black Whale After learning how to read, a bondsman in Antebellum Texas dreams of being free. However, death is the fate of anyone who attempts to liberate him. It's wonderful to hear Bret's voice on CBSRMT. For most of us, he will always be the voice of Lamont Cranston, alias The Shadow. I particularly like his performance in A Scaffold for Two. 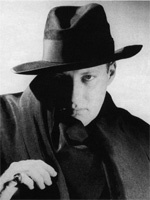 It was around the time of his CBSRMT shows that Bret recorded two new episodes of the Shadow for an LP-collection: "The Computer Calculates, but the Shadow Knows," and "Air Freight Fracas." The early 1970s had a lot of nostalgia for OTR, and CBSRMT rode that wave long enough for this person, born in 1968, to catch the fever in first-run episodes, and to forever enjoy audio drama.